The scenes emerging from the string of terror attacks today in London are both terrifying and eerily familiar. A bombed-out shell of a bus, shaken victims covered with blood and soot, emergency services crews evacuating the injured – it was jarringly reminiscent of the carnage that has appeared on the streets of Tel Aviv, Jerusalem, Haifa and Beersheba over the past several years. 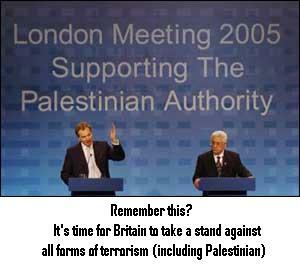 London, England, as it were, has now become London, Israel. The UK has long been one of the Jewish state’s best friends in Europe – though of course that is not really saying very much. Our hearts go out to the victims – innocent men and women on their way to work, fighting the daily struggle to make a living, improve their lives and take care of their families. It was just a few weeks ago that reports emerged of contacts being held between British officials and Hamas, the Palestinian terrorist group waging war on Israel. One can only hope that in light of the atrocities carried out in the heart of Britain’s capital today, Prime Minister Tony Blair’s government will gain a renewed sense of moral clarity, as well as determination to do battle with terror – wherever it might be.